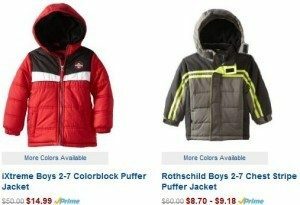 Amazon: Winter Coats for Kids Only $8.70! You are here: Home / Great Deals / Amazon Deals / Amazon: Winter Coats for Kids Only $8.70! Wow! If you are in the market for winter coats for the kiddos, hurry over to Amazon and get them for as low as $8.70! Super Saver Shipping will be FREE with an order of $35 or more or get FREE 2-day shipping with Amazon Prime. We always buy coats every winter for a donation drive at our church and these are great deals.